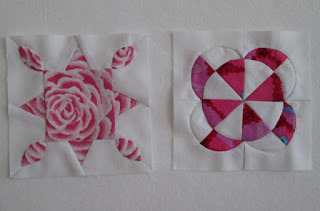 I got two Dear Jane blocks done this week. I started with pink because January is Pink. D4 Crystal Star is on the left and C5 Eye of the Cyclone is on the right. I was very sick with the stomach flu and had no energy for anything so I organized my Dear Jane. I am felling much better now, thank you all. 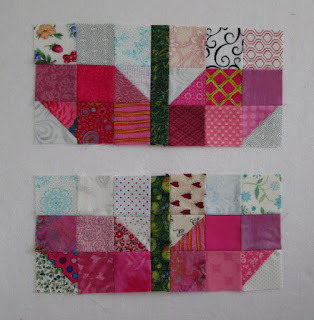 I plan to work on the blocks at my own pace and do some for the colour of the month or here and their I am not really using scraps but I do not need to buy fabric and will use mostly stash fabric. I am hoping to make a Dear Jane page on my blog. 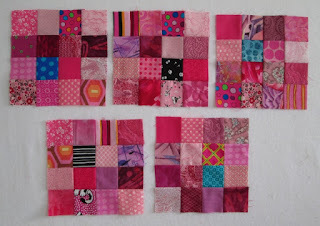 There are many more pink blocks to check out over at Soscrappy. 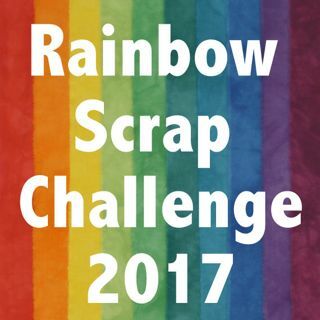 Come and join us on the Rainbow Scrap Challenge 2013, even if you only do one block a month. You will have a pretty Rainbow quilt ready to quilt at the end of the year. I got four more butterflies done to add to the other 20 I did two weeks ago. I started doing 16 patches last summer (when we did Purple I think). I would like to make four more for a total of 9. I still have a little time till the end of the month. Note, one square is not like the others. More Bonnie Hunter Spools as Leaders and enders. 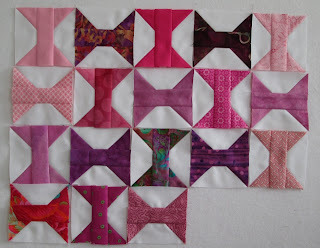 I had 26 done and add this 18 for a total of 44 pink spools so far. I have a few more to finish the month up. No, not another quilt really. I just had to make a few 8" hearts. Not sure what I will do with them. I just had to make them. Now this is a new quilt. It looks like crumbs or poverty piecing but it is the center of a "round about" quilt. I am calling it a "Round About". 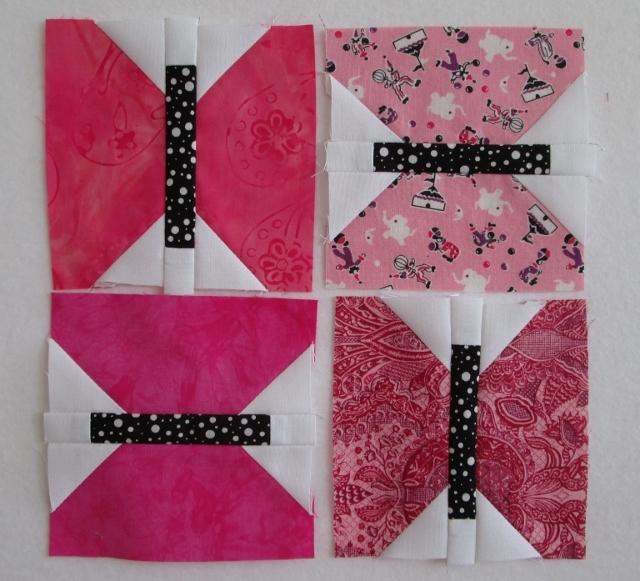 I am going to add to the outer edges of the quilt each month. It may have the look of a very large log cabin in the end. Maybe. We will have to see how it looks at the end of the year. I am not squaring it up and already is a little wonky. I hope it will look more wonky soon. This block is called Scrappy Sprouts. I found the block back in October and saved the pattern. Today I just got my first two blocks done. I found the pattern at Tracy Jay Quilts. She had asked for blocks but I did not send any. I was thinking I might add a flower of something to the top. Not sure yet. So she had been working on the quilt and guess what. She just got the quilt top done and showed it today Scrappy Sprouts top. 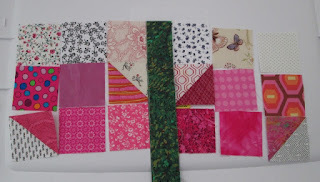 I have one more laid out to sew. 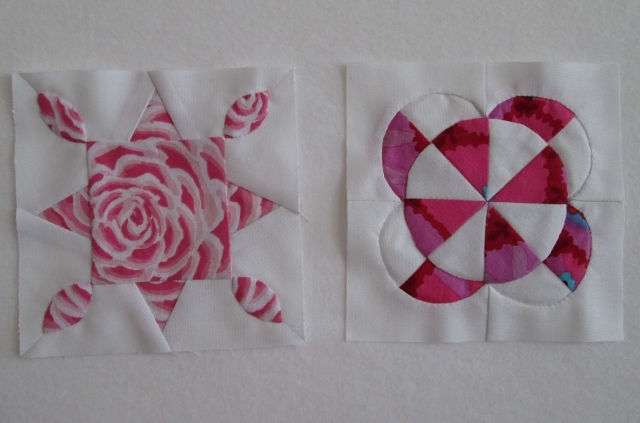 Yeah for two finished dear janes! 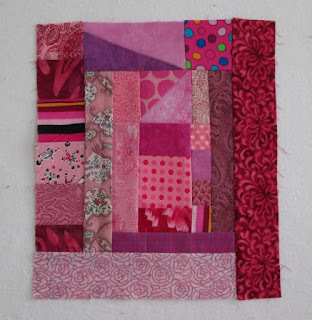 I followed the link to the scrappy sprout quilt. WOW, what a great quilt. So many great pink blocks. Love them all. Whow I am really impressed. Great job, well done!!!! Love that there is someone else as crazy as I am to do more than 5 different quilts at once. Thanks for sharing all your crazy goodness, I know I am in great company now! I have to say I LOVE every one of your projects! Cathy, I don't know where to start, I just love everything you are doing in pink. I might have to copy a couple of ideas. I see a Round About in my future and may a Scrappy Sprouts. Wow on all those pink blogs! Love your spools! I'm glad you are feeling better, Cathy. 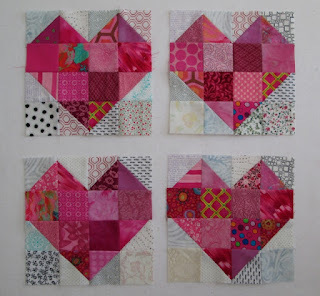 I love, love, love all your pink blocks! You pink 16 patch heats are to die for. I must try to make one. Great post. Wow - you got a lot done despite the fall and the flu. Love your hearts and butterfly's.